Venue open houses can be fantastic opportunities. Undecided couples get a physical/visual feel for their wedding as the venue fills with people and excitement. It’s also an honor to be invited to attend as a recommended vendor. Venue open houses can be as different as the venues themselves. Venues and vendors win when they look after each other’s best interests. Here are a few tips to experience a positive and effective open house. 1. Always confirm the date, time, location, set-up, tear-down, and set-up details (table size, location, etc.). 2. Avoid being late by checking road traffic conditions, planning alternative routes and leaving plenty early. 3. Have a contact number at the venue to call if you become detained or are arriving late. Consider offering to relinquish the open house to avoid awkwardly setting up when guests are present. The venue can easily use the table elsewhere or just remove it. 4. Bring hand lotion, hand sanitizer, tissues and any other personal items you might need. Keep personal items hidden under your display until needed. If food will not be provided for vendors, bring a snack or energy bar and your own water. Gum chewing indicates boredom and is not recommended. 5. Always dress your best. Ask the venue if the attire will be casual (jeans), resort casual (no jeans) or should you dress as though you are working at a wedding. 6. When setting up, consider the venue’s foot traffic expectations. Big crowds may require you to stand behind your table so as to not block foot traffic. If you expect light foot traffic, set up so you are standing in the traffic path to shake hands and be as approachable and personable as possible. 7. Most foot traffic goes in one direction or the other. Always invite the guests to meet the vendor at the next table, i.e., “Be sure to meet Tom’s Photography at the next table. He really knows this venue.” It gives a comforting impression of compatibility and credibility. 8. Don’t be seen on the phone, texting or surfing the web during open house. Step away on a break to do phone business and come back smiling. 9. Thank the owner, manager or person in charge. Ingratitude is never ignored. 1. Invite the best vendors. It confuses couples if each vendor is not a recognized leader in their field. Helping new or struggling vendors might be admirable, but it can also backfire. 2. Explain the food and drink policy of the open house. If you do not want to see vendors eating randomly at their station, tell them. Planning to feed the vendors, perhaps before or at the conclusion of the open house? Let them know in advance. 3. If your venue has wifi, provide the login information so your vendors can do quick business on a break. 4. The person in charge should stop by every vendor, shake hands and say “thank you.” Take time to listen to any questions or comments. To do so verbally confirms the value of the relationship. 5. Meeting people can be awkward. If you have a new employee, consider getting name badges immediately and personally introduce them to the vendors in a friendly way. Don’t expect either of them to take the first step when you are providing the hospitality. 6. Set standards for open house attire. If you don’t, your vendors will. Insist on wedding day attire if you want everyone looking their best. If you prefer not to see vendors in jeans, tank tops or open-toed shoes, say so. The vendors will appreciate it. 7. Are you periodically annoyed by insects or varmints? Do you have any security or infrastructure issues? Don’t be embarrassed to tell your vendors. They can be prepared and will gladly run interference if anything is noticed by guests. 8. Give open house attendees a list of the vendors they are meeting. (Supplying your wifi login will enable them to visit websites). You can provide a property map identifying each vendor’s location on the property or in a room. Otherwise, expect confused looks from potential clients as they wander about. 9. After the open house, send out an “Open House Survey” to the vendors to find out any issues or opportunities for improvement. Open houses can be fantastic opportunities as undecided couples get a physical/visual feel for their wedding venue. Venues and vendors win when they look after each other’s best interests. WHAT KIND OF CEREMONY DO YOU PERFORM? Couples call us every day because they need someone to officiate their wedding ceremony. One of the first questions asked is, “What kind of ceremony do you perform?” While we are quick to answer that we consider our ceremonies romantic and upscale, we are certain to inquire abut the kind of ceremony our bride and groom want to have. There isn’t just one kind of ceremony. There isn’t one traditional way to have the words presented. Every couple has seen and heard wedding ceremonies and developed their own preconceived idea about how the ceremony is to go. We often present new ideas and concepts about wedding ceremony trends, but the minister should honor the couple’s desire to have the kind of ceremony they want. Church Weddings. Christian denominations include Catholic, Mennonite, Presbyterian, Lutheran, Assembly of God and many other Bible-based churches. Every Christian denomination has it’s own church tradition. While other denominational churches may share some of those traditions, the couple would be getting married into and by the authority of that specific church’s denomination. Nondenominational Weddings. A nondenominational wedding is a Christian ceremony without any specific “denominational” overtones. That is, there isn’t a mention of being married by or into any specific church tradition. It’s just Christian, and that can generally satisfy all traditional denominational expectations. Religious Weddings. There are also Jewish weddings, Mormon weddings, Hindu weddings, Persian weddings, and a wedding for virtually every religious sect. Each has its own traditions from breaking a glass, asking the bride’s vow three times, sipping from a glass of wine, jumping the broom, reading from a sacred text, among others. New Age Weddings. In the past 100 or so years, America has welcomed many new religions. While some of their traditions may date further back, most consider Religious Science, Bahai, and the Church of Scientology to be rather new. These non-traditional churches exist with constitutional First Amendment rights, and each have their own methods of marrying a couple. Who could forget the Unification Church wedding where Rev. Moon married a stadium full of couples, many brides and groom having never met before that ceremony? Civil Weddings. A civil wedding is often brief and not romantic. People requesting civil ceremonies usually want a brief ceremony with no religious overtones. Many a judge and justice of the peace have performed “hit and run” civil ceremonies, leaving a couple with a five minute or less set of “I do’s.” Arizona Ministers perform civil ceremonies, sometimes brief by request of the bride and groom. However, we often perform a civil ceremony in a romantic and caring fashion, with duration of up to 25 minutes. Interfaith Weddings. In this melting pot called America, many couples marry a partner of a different faith. Many church and religious hierarchies frown on this practice, but families of two different faiths enjoy many successful marriages. When we plan and perform an interfaith marriage, we are very sensitive to the expectations of both families and always perform a wedding that is acceptable, if not completely satisfying to both. Ethnic and Cultural Traditions. Today’s brides and grooms read a lot of wedding related material…hey, you’re reading wedding material! There they learn about ceremonies that include wrapping a couple in a lacy manteau, or cape or a mother of pearl lasso. Some couples present each other with gold coins as a symbol of sharing their family wealth. Many weddings include a traditional lighting of a unity candle and some are enjoying the trendy pouring of sand into a single vessel. We are often asked to include a native American blessing and have even accepted smudging for a couple’s wedding. The Brave Heart wedding of Celtic origin will feature a hand fasting, symbolizing the union to which they have pledged their lives. Let’s not leave out the children in a blended family ceremony but also have the parents pledge love and support for them. Theme Weddings. We have officiated at Renaissance weddings, costume ball weddings, luau weddings, cowboy weddings and even an X-File wedding. Virtually every religious or civil ceremony can have a theme added to it. It makes the wedding different, special and usually, unforgettable. What kind of weddings do we perform? There isn’t just one kind of wedding ceremony. We want your wedding to be remembered as romantic, upscale and exactly as you dreamed it would be. Ladies… this one is for the guys, so feel free to share it. I’m no Steve Harvey and I don’t remember much about taking four years of Latin in school. The first sentence I ever learned was “Vestis virum reddit,” the clothes make the man. As Arizona Ministers we always ask about attire so we look our best at your wedding. Clothes can be empowering or debilitating. The wrong shoe size, a tight collar or baggy trousers at a wedding only detract from the celebration. No man should be tugging at, letting out, or pulling up his clothes in front of his family, friends and fiancé. It’s not a prom! 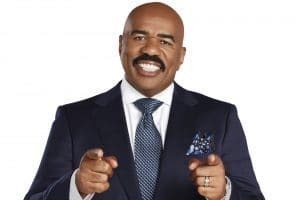 Think Steve Harvey… always sharply dressed, impeccably groomed and full of confidence. From presidents to late night television hosts, any man can rock a suit or tux as long as it fits correctly. 1) Find out what sharp-dressed men are wearing. Find someone with your frame and posture that always dresses well. News anchors, television hosts and celebrities are worth checking out. Thumb through your fiancé’s wedding magazines for some ideas as well. You might even choose a groomsman that dresses to impress. He can give you some advice and keep an eye on your appearance throughout the wedding and reception. 2) Decide if you are going to buy your wedding clothes or rent them. Renting is a great choice if your bride is renting her wedding gown and you don’t mind wearing something that will eventually look dated. If you rent, try on every piece from shoelaces to tie and jacket to make sure it fits comfortably before you leave the store. Otherwise, consider meeting an experienced clothier to find an affordable, more timeless suit you can purchase and wear to impress into the future. You and your fiancé will be jazzed every time you wear it. 3) Be properly fitted with the correct collar, sleeves and inseams. Some stores perform minor modifications in house and others refer customers to neighborhood alteration shops. This is no time to accept something imperfect. If it fits right, it will feel great. 4) Do not wear your coat/jacket in the car. It will look like you slept in it. Dress at the wedding venue if at all possible. 5) Start grooming weeks before your wedding ceremony. Time your haircut so you don’t appear freshly buzzed or have tan lines around your hairline. Consider a manicure. Regularly lotion your hands especially right before the ceremony. Get to the dentist so your teeth look their best. 6) Some lovely woman is going to hug you and get makeup on your jacket shoulder. Simply have one of your groomsmen rub his jacket sleeve on your shoulder and the makeup will vanish. 7) The best dressed groom will have a soft laundered linen handkerchief in his inside pocket. She just might shed a tear when she sees you looking so confident and dressed so well on your wedding day. We like to help make everyone feel at ease and welcome during wedding ceremonies. Engaging the guests, attendants, parents, children, and of course, the bride and groom, allows everyone to feel included and important. There Are Many Ways To Make Wedding Ceremonies Inclusive. Have mom stand with dad & daughter at the presentation of the bride. The image of both parents presenting their daughter for marriage is a once in a lifetime event and priceless. We find most mothers are pleasantly surprised by being invited to stand a little closer to their daughters at this important time. 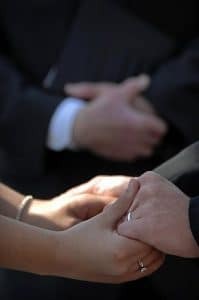 Make sure the officiant is personable and caring enough to consider others. Wedding ceremonies often involve more than an officiant. There can be readers, tributes, special music and even video, all of which the officiant orchestrates into the ceremony. A personal ceremony should be performed only a short embrace away. We find it more intimate not to have a lectern, microphone stand, books or shuffling pages of notes to be read between oneself and the couple. A wedding ceremony should not be treated like a classroom experience with a lecturer. The ceremony is no place to teach lessons or take notes for that matter. The officiant should speak to the bride and groom… not talk over them. He should talk about them, not just about marriage, responsibility, duty, etc. A play is not performed by people reading scripts and wedding ceremonies should not be performed reading from binders. Recognize other friends or relatives important to the relationship. It’s always nice to mention when parents or grandparents have celebrated significant milestone anniversaries. To mention the friend or sibling that introduced the couple is sometimes endearing. If the wedding is being broadcast live to relatives and friends on the internet, the bride and groom can take a moment to wave and say ‘hello’ to them. The inclusive minister will involve the guests. He can ask for their blessing, provoke applause and recognize any appropriate spontaneity. It takes experience to engage an audience, and an officiant with an inclusive attitude can make it happen. A second language can be added. If multi-lingual guests are expected to attend, even saying “hello” in someone’s language makes them feel special and included. Get the minister out of the way. Toward the end of the ceremony we often go behind the guests so everyone can see the ‘cake topper’ the couple has become. Guests love to see the bride and groom’s expressions as they are ‘pronounced husband and wife’ right before they kiss. Plus, the guests are now at an advantage to take their own keepsake photograph of the couple. Get out of the gazebo. 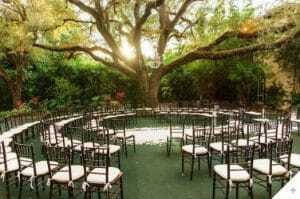 When a ceremony is celebrated inside, instead of in front of some gazebos, the guests can feel left out or irrelevant. It’s fine to enter the gazebo for a candlelighting or such, but to spend the entire ceremony in space separate from the guests is not inclusive. Have the ceremony in “the round.” From the center of the circle, we slowly turn the couple during the ceremony so everyone has the bride and groom in front of them at some moment. It also enables the photographer to get more of those photojournalistic pictures with lots of the guests included with the bride and groom. Place wide seating so furthest guest is not that far away. When 3 or 4 chairs on each side are placed 24 rows back, the guests in the back can feel disengaged. If 8 chairs are placed on each side with 7 or 8 rows total, the farthest guest is much closer. Add a responsive reading that the guests can recite. Scripture, a poem or even a relevant excerpt from literature can be read back and forth by the officiant and the guests. Again, involvement makes a wedding inclusive. Avoid using a microphone if there are fewer than 50 guests. It actually puts space between the officiant and any readers and the guests. Like radio commercials and annoying announcements, some people simply turn off their listening when someone uses a microphone. Arizona Ministers like to help make everyone feel at ease and welcome during wedding ceremonies. Engaging the guests, attendants, parents, children, and of course, the bride and groom, allow everyone to feel included and important. It’s been said that performing weddings is “a great gig.” Dress up, say the names right and you’re out of there. It’s also believed clergy get tax breaks and unmerited perks. Well, here are the perks and breaks. Clergy pay both halves of their Social Security. Like many, clergy are responsible for their own lives, including health insurance. If it rings, clergy cheerfully answer the phone at 3:00 a.m.
Clergy follow a tradition steeped in mystery. Because of a book, clergy have to convincingly explain the benefits of a personal relationship and faith in someone unseen and silent. Performing in public and under an oath, clergy are sometimes judged harshly and accused of ill motives or insincerity. Concealing personal emotion, clergy pray with patients and anxious relatives in emergency rooms and intensive care units. Clergy announce the birth of a child or whisper the death of a loved one to families, sometimes in the same hour. They accompany parents to their rebellious children’s detention hearings. Clergy serve in the presence of convicted and sometimes dangerous felons. Mentally ill and people disappointed with God or a church target clergy with contempt. Clergy are often assumed a source to help pay for challenged people’s rent, groceries and utility bills. Families often turn to clergy to help settle volatile family disputes. Clergy spend some of the most valuable time away from their loved ones, serving evenings, weekends and holidays. Clergy are eligible to become chaplains in the armed services and are sometimes killed or wounded in the line of duty. No other performer pays liability insurance because ministry is a profession. No one is complaining, but those are the breaks. And yes, performing weddings is a great gig. Arizona Ministers: it’s not what we are, it’s what we do. Arizona Ministers asks every couple if they would like to write their own vows or say some special words to each other during their ceremony. Some answer an enthusiastic “yes,” some quickly say “no,” and others are still thinking about it. Those who want to write their own vows have likely already given it some thought. They have something on their hearts that they want to say to each other in front of family and friends. It could be detailed and lengthy or just something short and simple. Funny is okay, too! Fear of speaking in front of the guests can make some people nervous. On the other hand, there is nothing more romantic than speaking intentions outloud. You will write these vows and become very familiar and comfortable with the words. If you just can’t speak at your ceremony, no worries. Arizona Ministers will ask you the traditional wedding vows and you will still have these endearing words to share together on your honeymoon and every anniversary in the future! When composing those meaningful words, it must be decided if they will be private until spoken at the ceremony or shared together beforehand. Some couples work on their vows together, even creating a little dialogue or banter. In addition, couples writing their own vows can still answer the officiant’s traditional “I do” or “I will” wedding vow question. 1) Describe yourself a little. 2) Explain where you have been on this journey of life. 3) Tell about this special person you have met, fallen in love with, and is marrying you today. Really, any combination of words you write and say will be genuine, sincere, and appreciated by the other. If you have time to Google ‘wedding vows,’ you will find millions of examples at your fingertips. Poetic, romantic, spiritual, there is nothing off limits to say. When you come up with those right words, you can email them to Arizona Ministers. We will bring a copy for you to read when that time comes in the ceremony. You can also go online (Etsy) and find small blank books in which you may handwrite your words. These will become family heirlooms for sure! Give it some thought and reach out with any questions. We want to be your favorite! There are beautiful days at The Grand Canyon. Pine trees scent the surrounding forest, enormous birds soar above, and others sing around the abundant wildlife. Elk, mule deer, ringtail cats and mountain lions wander among the canyon. The views and memories are endless. Also, temperatures can reach 100 degrees in summer, storms can appear out of nowhere, and the roads are frequently closed due to snow from October through May. Gas is scarce and expensive. Multiply any discomfort during holidays, especially summer holidays! The Griswolds were not the first to learn it’s best to be prepared for the long trip. And also some of our favorite businesses to visit along the way! Favorite ceremony sites include Grandeur Point and Lipan Point. The very best spot is Shoshone Point, which is not on most maps. With a permit it provides exclusive use of a gated point, five parking places, a ramada, restroom and the best views in the entire park. “Shoshone Point” was chosen because it’s the only point offered with a private parking lot guaranteeing a place to park on the rim. With more than 5 million annual visitors, sometimes there are just not enough parking places for everyone at the points open to the public. Remember, these drive times can be affected by weather, traffic and the wait time at the National Park Main Entrance. Add much more time if driving through Cameron and the National Park East Entrance. There are also options for flying into The Grand Canyon National Park Airport. This trip is so worth it! Here’s a “just in case” list provided for your comfort.